From: Bine & Vine in Normal Heights (San Diego), Calif.
Not a huge fan of American Barleywines, so not expecting much from this. Kind of perplexed by the tiny cans, which I’ve seen recently in four-packs. Thinking a 22-oz. bomber would be better (and maybe more affordable). Aged exactly two years and one day. Smells liked bready hopped caramel. 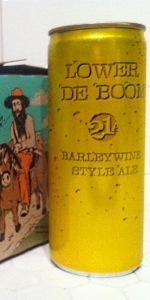 I usually don't care for american barleywines but two years seems to have treated this beer brilliantly. This is how I wish all those wasted bottles of bigfoot would have aged. The hops, although present in the nose, are just a tad there in the flavor. Sweet bread and a vestige of ripe fruit are complimented by the lingering hops. Mouthfeel is spot on what I like in a barleywine. Overall I wish I had more to see how it would be in three and four years. More a crazy bold IPA than barleywine. The pineapple comes the moment you open the can. Served cold and I didn't wait for it to warm up. Surprised at the abv as I'd have guessed it was around 8 or 9 tops. Not 11.5! Hoppy, not enough body for my barleywine soul. Too strong for food. Not a thoughtful beer. Gave the other and away. Pours mostly clear amber red with a creamy frothy off-white foam head. Smells like toffee, caramel, molasses, cherry, plum, red grape skin, apples, asian pear, rich vanilla, mild chocolate, toasty graham crackery malts, some grapefruit and orange citrus, with floral earthy herbal grassy pine. Tastes like toffee, caramel, molasses, spice, cherry, plum, red grape skin, apples, asian pear, vanilla, mild chocolate, toasty graham crackery malts, some grapefruit, orange citrus, with floral earthy herbal grassy pine. Feels medium-light bodied, creamy and slick with moderate carbonation. Overall a really nice barleywine. Look- 4.25- Dark copper, crystal clear, off white head, one finger head, fades fast. Left small amounts of lacing. Smell-4.25- dark and sweet malt character, with notes of fruit like plum and apricot, maybe peach. Taste- 4 - malt character like dark sweet bread with faded hop flavors of pine and resin. Dark fruits like cherry and plum. Notes of peach and apricot. Feel-4.25- low carbonation as per style, thick full body even when room temperature. Hot alcohol feel in throat and mouth numbing capablities. Overall- 4.25 - when I rate, I rate 80% to style and 20% to personal preference. I don't particularly enjoy this style, but it fit in the style neatly. I thought it could have had even more malty presence and perhaps a little more complex flavors but overall a solid example of the style. However, not my favorite. Probably won't buy again based on preference but I'm glad I branched out and tried it. Pours a dark golden amber color with ruby edges and a half finger off-white head that quickly settles into a lasting ring. Spotty lacing left behind. Earthy and leathery malt aroma with a surprisingly strong floral and citrus hop presence. Citrus and tropical fruit notes along with hints of leather and dark fruit. Slightly earthy and oily with some mango, pineapple and grapefruit followed by toffee, caramel malt, raisin and fig. Interesting take on the American barleywine style. I'm used to a ton of hop bitterness in this style but this is dank and floral with a surprising amount of citrus and tropical fruit sweetness. There's still some dry, resinous bitterness but hints of grapefruit, papaya and orange peel balance things out. Earthy malt backbone with hints of leather, caramel, toffee and dark fruit notes. Some plum, raisin and date add a vinous character that compliments the sweetness. The high ABV is very well masked with only slight heat, making this strong beer dangerously drinkable. My only complaint, and it's not a minor one, is that the bitterness and tropical fruit sweetness overwhelm the barleywine characteristics. A bit too sweet and in my opinion needs more heat and malt flavor. Otherwise, it's a pretty solid, enjoyable beer. Review is from the itty-bitty gold can. Pours a nice and pretty clear amber ale with an off-white head. The aroma consists of light citrus and sweet malt. Cinammon. Some dark fruit. Red grapes. Taste is slightly bitter up front with a decent amount of hops. Citrus is blended into this barleywine which takes it away from the traditional. Light grapefruit rind on the aftertaste. Long finish. Overall this is a decent barleywine. The fruity/citrus taste was good but not great. Got a little tiresome even from the small can. Worth finding and trying but overall just not my style of BW. I will say the 8.4 oz. was an interesting can. I hope some of the other high alcohol beers take this concept. Plus it's pretty easy to sneak into a sporting event. Just saying. Boom, indeed. Forget the little cute can it comes in, this one hits full on from the get-go with alcohol burn. Aroma and taste give away to high ABV, faint malt backbone lies somewhere in the mix, but an overall smooth and slightly sweet experience. Nice! A - Cream head on initial pour that all but disappears. Attractive translucent amber color. S - Very intense sweet malt like you'd imagine. T - Sweet caramel malt flavor with hop citrus. Lots of booze as well but it's expected and warranted. Looking for a little more hop bitterness but it's not there. M - Little carbonation and a very smooth malt full bodied feel. O - It's good. The more you drink it the more you like it. I'm actually more familiar with aged barleywines so this was hard to rate at first. 8.4oz can (canned 2/5/13) poured into a Throwback snifter. A - Pours a medium depth coppery amber color with excellent clarity. A faint attempt at forming a head fails quickly and leaves only a small collar of white bubbles around the edge of the glass. S - Smooth alcoholic boozy aroma up front, plenty of hop aroma - bright and citrusy orange and grapefruit, rather grassy as well. Smooth, sweet malty base, a bit doughy and grainy - nice balance to the hops here. T - Hops up front, firm bitterness with lots of citrusy hops to go along with the bitterness. Noticeable alcohol and a mild malt base. Bitterness lingers and gives a medicinal flavor after the swallow. Starts off really nice on each sip...somewhat reminiscent of Bigfoot in the early stages of each sip with a fresh hop character that breaks thru the malt. Towards the end it gets a bit messy and loses its resemblance. M - A bit on the thin side for a barleywine. Medicinal bitterness, a bit boozy and warm. Carbonation is mid-level and tingly. Decent balance between malt and hops - definitely a hoppy American barleywine. O - Appearance and aroma had me filled with high hopes. Even the first sip showed good promise. Half way thru the first sip, things changed a bit. The hops took on a medicinal quality in its bitterness that took away many of the fine points in the flavor of this beer. The medicine-y nature continued through the swallow and lingered long on each sip. I love a good and hoppy barleywine and I thought this had lots of promise. Overall, not bad - but had much more potential. I could drink this again, but probably won't...just doesn't live up to other easily obtainable hoppy American barleywines.